Kailash Mansarovar Yatra is the organic and pure Hindu, Buddhists pilgrimage tour of Holy Mount Kailash and Holy Mansarovar Lake. While talking about the Mount Kailash, it lies in the Gandise Mountain range, western Tibet. It is called that Mount Kailash is the sacred mountain for four religious groups: Hindus, Buddhists, Bonis, and Jainis. What they believe is that this Holy mountain is the center of the Earth. According to the Hindus devotees, this mountain is the home of Lord Shiva who is the creator and destroyer of this Universe. Kailash Manasarovar Yatra is spiritual belief of the Hindu and Buddhist pilgrims. Your Kailash Mansarovar Yatra begins from Kathmandu( City of temples) with a scenic drive to Kerung (newly opened border between Nepal and China, Tibet). In Kerung, there will be custom formalities to enter to China, Tibet. Then, You will be continuing our to drive through an amazing landscape of Tibetan Plateau. During your Kailash Mansarovar Yatra, you will first reach to Mansarovar Lake. Mansarovar lies at high altitude and is huge fresh water lake which is located north of Mount Kailash with the circumference of 88 km. The word Mansarovar is a Sanskrit words that compiles two words Mana and Sarovar. Mana denotes mind and Sarovar means lake. In this Lake, you will be resting for while and watch the scenery that lake offers. If you wish to take a dip then you can. There is believe that after having dip in Holy Manasorovar lake, all you sins will be erased or washed away. Then, we will head towards base camp of Mount Kailash. 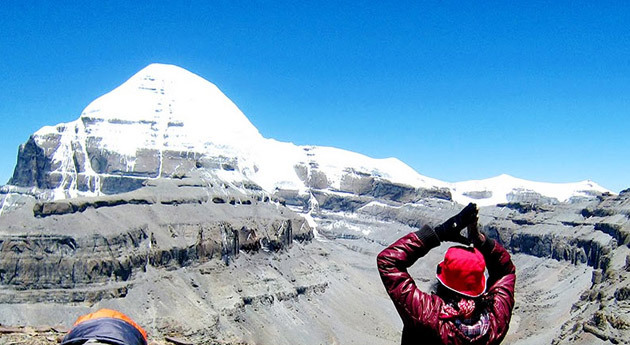 On the nest day, there will be hiking of the Mount Kailash Kora (Kora is the complete rotation of the Mt. Kailash) or Kailsh Parikrama. After your completion of the Kailash Parikrama, then you will return to Kathmandu following the same way as we had reach the Kailash and end this journey in Kathmandu. After the difficult trek to Mount Kailash, then pilgrims are required to have complete rotation of the Holy mountain Kailash either in clockwise or anti-clockwise. For the individuals who can’t do it by walking (since it for the most part takes 3 days), there is a choice of enlisting a yak or a horse. 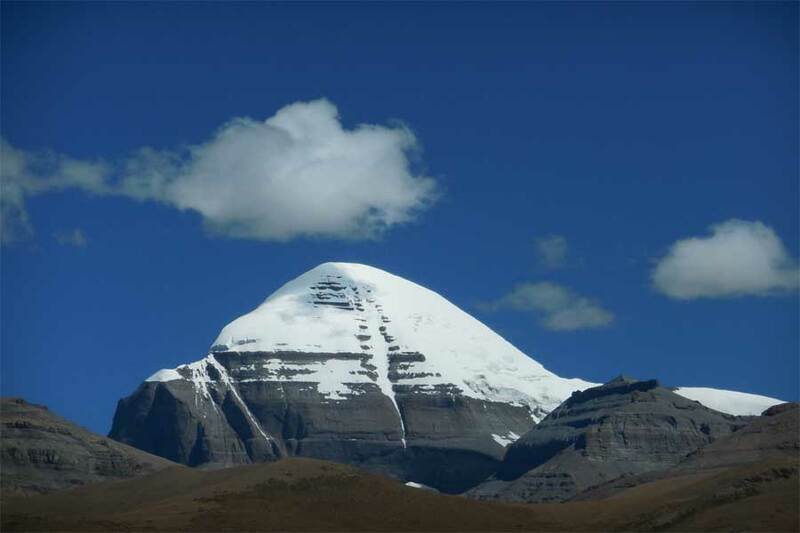 Mount Kailash and Manasarovar lake is the sacred place for mainly the Hindus, Buddhists, Jains and Bon. Hindu pilgrims regard this Mountain is the living place of the Lord Shiva with his Goddess Parvati on the top. According to Jains, Kailash is the place where Guru Jain Tirthankara achieved Nirvana. For Buddhist, this is the placce where Lord Buddha spoke to preeminent ecstasy, dwells. Similarly for the Bon (a religion which originates before Buddhism in Tibet) Mt Kailash is the place of divine power. Tirthapuri is more interesting place which is visited by people after Kailash yatra. In tirthapuri, there is Gauri kund where they bathe and also named as Lake of compassion. 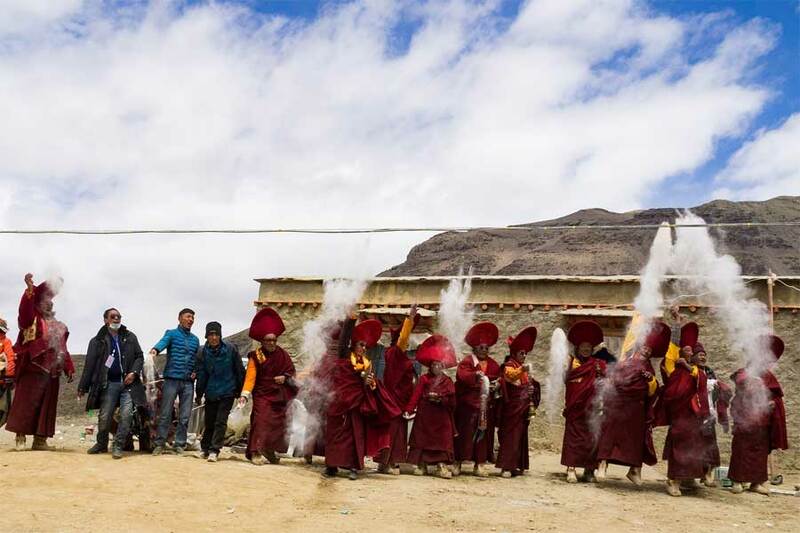 Apart from the Thirthpuri another must visit place is the Yam Diwar, Tarboche- flagpole with consist several prayer flags and Asthapad-bottom of the holy mountain- play an important according to Tibetan Spirituality. Want to Know More About Visit The Links Below. ✓Road or ✓Helicopter from Nepal. Please contact us or email us at sales@himalayantrekking.com for detail. Day 1 -Arrival in Kathmandu. Day 2 -Sightseeing in Kathmandu. Today morning will visit Nepal’s cultural heritage places as Pashupatinath Temple (One of the holiest Shiva temples in the earth).Here you see many Shiva temples and meet many Hindu Sages). Other places as Swoyambhu nath, bouddha are also among the beautiful places. Then further we will proceed to Chinese Embassy for the visa apply with your required documents. Overnight at hotel. In the morning, will head to Rasuwa Gadhi via drive (newly opened border of Nepal and China). Its a mountain drive passing through paddy fields, several villages and river. After Immigration and customs formalities on both sides (Nepal & China) drive to Kerung, small town of China. Finally we reach the destination, we will acclimatized and roam around to Kerung village. Then stay overnight at guest house in Kerung. After breakfast our journey from kerung to Dongba starts. En route enjoy panorama of Mount Shishapangma (8021 meter) and other high Himalayan mountains. You pass through Pelkhu tso Lake (4600 meter), a cobalt blue lake and later crossing Brahmaputra river reach in Saga. From Saga further 100 km of drive is to Dongba. Day 5 -Drive from Dongba to Mansarovar. Its an amazing drive through unique Tibetan countryside that makes everybody joyful all the time. En route you cross Mayum La Pass (5200m). This is first day to see Mount Kailash and Mansarovar. Reaching Mansarovar you can have holy bath in the lake. Your transport takes you to round the lake. Night halt will be at guest house of Chu Gompa which is in the shore of Mansarovar Lake. Today you commence your journey to Darchen, base camp of Mount Kailash, after lunch. Till that time you can do Puja (Worship), Havana, Meditation and also go for short Hiking to Chu Gompa (Ancient Buddhist Monastery nearby Mansarovar Lake). After reach to Darchen your guide will assist you if you need horse and porters for your following 3 days trekking around Mt.Kailash. Today will drive to Shersung. The starting point of trekking is from Shersung. From here after short walking you reach Tarboche. Here is small temple called Yamdwar by Hindus. Near to this temple you see great flagpole. It is said that here Buddha came with 500 disciples for their supernatural power. You continue walk passing through grassy plain populated by nomads. 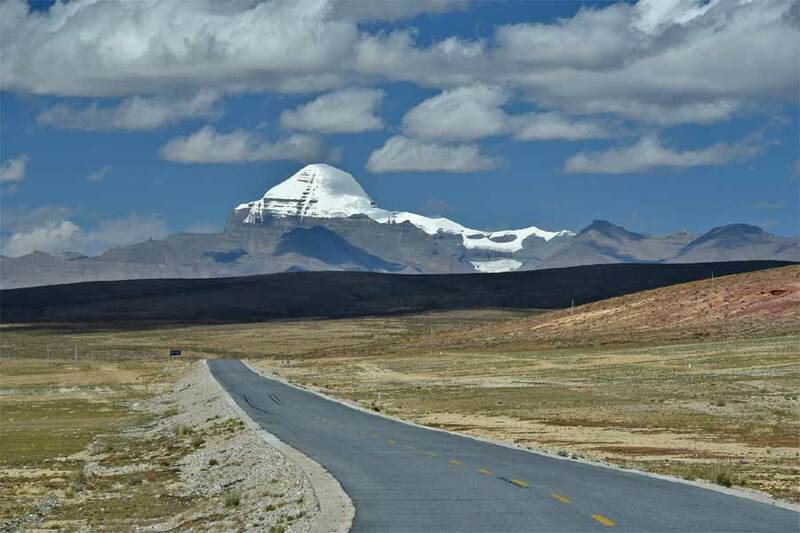 En route you can view of west face of Mount Kailash. Then you reach at Dirapuk from where you will have good view of the north face of Mount Kailash. The walk for today is little bit harder because to go up all the way to Dolmala passes (5723 meter/18776 feet). It is highest point in all this trip and then way down. From this trail you can have view of back side of mountain and many prayer flags at highest point. In Zuthulpuk, a temple and shrine is built around Milarepa’s cave where Milarepa, one of the most widely known Tibetan Saints, took dark retreat few years. He printed his hand and feet on the rock. Day 9- Trek from Zuthulpuk to Darchen. Final day of Parikarma. Drive to Dongba. Today the trek is short and easy walking day. You walk through grassy plain area along the river. The trekking end point is 4 km before Darchen. Once you reach there your vehicle come to pick up, then drive back to Dongba through the same previous road. Driving is through same incoming road.Overnight at guest house in Kerung. And again from there will go to hotel inkathmandu.